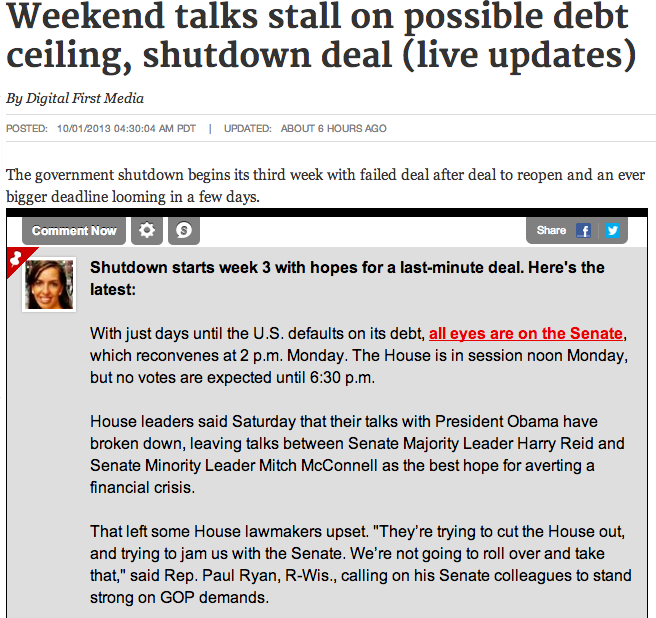 Since day 1 of the government shutdown, I took the lead running Digital First Media’s live blog on the shutdown, the debt ceiling and the launch of Obamacare — three of the biggest stories out of Washington in fall 2013. The blog got 105,000 unique viewers, was seen across Digital First Media’s 70+ metropolitan newspapers in the country and picked up by major news outlets such as boston.com, the free website of Boston Globe, and Sun Media, which owns the Toronto Star. I also ran a live chat with a political science expert on the shutdown. Read behind the scenes on how the live blog worked.